It’s hard to believe that Game 3 is already here. For Boston that means that it’s do or die time, since they are down 2-0 to Atlanta. Tomorrow night, they’ll fight for their lives. It’s only the first round series of the 2016 NBA Playoffs, but if you ask the players, this is the most important game of the season. Slated for Friday night, back in Boston at the TD Garden, the Celtics will want to get back on track on home court. In the regular season, the Celtics posted one of the league’s best home records in the past three months so this game at home should be an advantage for the Celtics, who will be looking to claw back into the series. It’s exactly what they’ll need to do if they want to put a dent in the Atlanta’s two-game advantage. They’ll have to forget the last two games and the disturbing trends that took place in those first two games. Boston shot 23.1 percent while falling behind by 17 points at halftime, before their comeback fell short in a 102-101 series-opening loss. That first game of the series went down to the wire and was exciting, the fourth-seeded Hawks only won by a narrow margin and no one team looked dominant. It was anyone’s game. Hawks point guard Jeff Teague played the hero for his team, and finished the game with a double-double, with 23 points and 12 assists in his stats sheet. One important assist he made was a pick-and-roll that he set-up for team mate Al Horford when the game was tied at 88 each. He was an impact player during the final three-minutes of the game. In Game 2, the Hawks gave a more convincing performance and really earned the win with a final score of 89-72. In this game, guard Kyle Korver came through shooting non-stop to pile in points for Atlanta. He ended up with 17 points, along with seven rebounds and two assists, shooting 6 out of 9 from the field (5 out of 7 from the three-point area), and posted 32 minutes of court time. 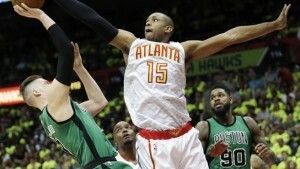 The Hawks were very successful in preventing the Celtics from making too many scoring runs. They held the Celtics to a measely 31.8 field goal shooting percentage. Boston forward, Jae Crowder didn’t make much of an impact that night, and has been cold of late as far as his shooting went. He only made 1 out of 9 of his field goals attempts. Boston Point guard Isaiah Thomas was the team’s leading scorer in the game. He posted 16 points, along with three rebounds and two assists. But it wasn’t enough, and after in talking with media he spoke about his team’s effort. Thomas said that the necessary adjustments should be, and will be made immediately. They can’t cost losing Game 3 in these readjustments. “Those guys gotta step up – including myself – and we all just have to put one good game together to give us some confidence,” said leading scorer Thomas at practice. His 16 points was way below his season average and so was his shooting of 4 of 15 on Tuesday. So if he is the star his fans and team thinks he is, they will step it up at home, in front of their crowd, on their hardwood and take it to the Hawks. Looked for Atlanta to get clipped in Game 3.